December 2018 - Christmas holidays are the opportunity to spoil your loved ones and gather around gourmet and tasty dishes. On this occasion, Le Cordon Bleu Paris Chefs, directed by Eric Briffard, MOF and Head of the institute, present their recipe from the book Ode to the truffle. Quickly brush the truffles in water, then dry. Peel the truffles with a vegetable peeler, cut thin slices and then stamp out 3 cm Ø rounds with a pastry cutter. Chop the truffle trimmings. Remove the scallops from their shells and refrigerate. Peel the chervil roots and immediately place into the milk and water, add the garlic cloves and bay leaf. Season with salt and bring to the boil. When cooked, drain and remove the bay leaf. Blend in a blender and add the lightly salted butter. Add a little warm milk to thin the mousseline. Finish with chopped truffle. Keep warm over a bain-marie. Stamp out 3 cm Ø rounds from thin slices of red meat radish. Reduce the balsamic vinegar to a syrupy consistence. Pan-fry the scallops in olive oil, season and pat dry with paper towel. Wash the watercress, remove large stems keeping small sprigs of leaves. 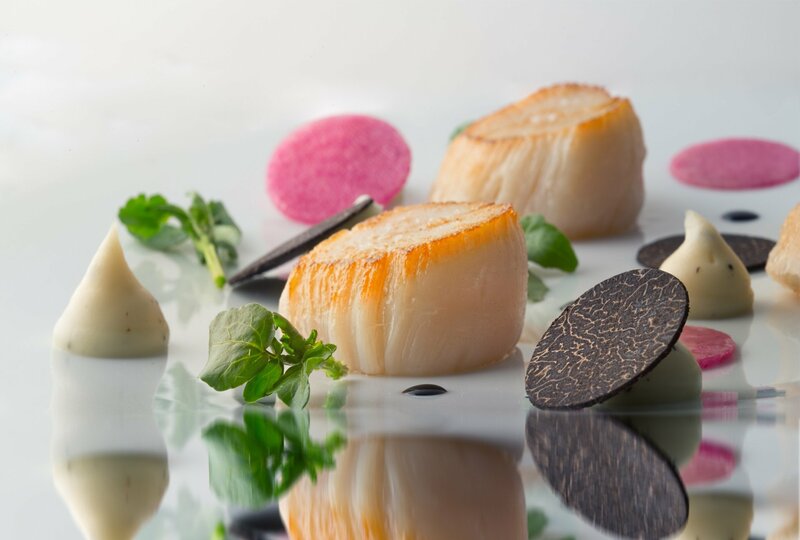 Pipe or spoon the chervil root mousseline with truffles onto a plate and add 3 scallops. Arrange the red meat radish and truffle rounds. Finish with a few watercress sprigs and place a few dots of reduced balsamic vinegar onto the plate. Le Cordon Bleu recipe published in the book Ode to the truffle, Éditions Sutton©2018 for English version.